YAY! :) I love these posts! 1. When are you showing your nursery?! 2. What has been the hardest thing about pregnancy for you so far? 3. What are you most nervous about when baby boy comes? 4. Do you have a name picked out? What has shocked you most about being pregnant? Something you didn't expect. I know this is a lame question, but do you know how many calories a day you consumed each trimester? BTW - I am pregnant! :) I had email convos with you regarding SMEP. Anyhoo, I am freaking out about gaining weight...big fat sigh. And the problem is - I am always hangry! 3- how soon after you have baby can I come see you? 4- love life during pregnancy. Did you keep it hot? Did it get stale? Did it not exist? Love these posts! I'm 21 weeks pregnant so I love seeing what other mama's think! 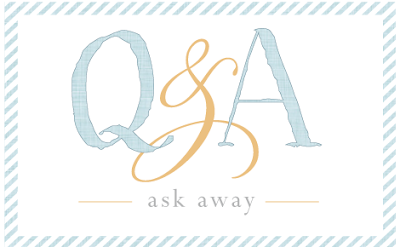 What is the best advice you have received for pregnancy and/or after the baby is born? 1. do you have a birth plan? if so, how have you approached it? 2. will you do a post after baby's born on newborn essentials (I am about to start registering- so overwhelming!)? Did you use an ovulation kit or count the days and then try? Were you paranoid on food you were and weren't supposed to eat? Caffine, how much do you drink? Are you getting the pup ready for the new arrival? I wish I had a question of my own. But I don't, so I'm just going to second the question above -- what names are you thinking? Did I miss that anywhere? Sorry. OH - HERE'S A QUESTION: In honor of our last mishap, what is the first drink you're going to drink after you give birth? I'd like to hear more about your eating habits + exercise while pregnant. Do you count calories? Do you work out? You look great, so I'd love to learn for down the road one day! What will you miss about being pregnant? do you get annoyed that most conversations now are about pregnancy and/or life with a little one? do you at all wish little man was growing up in so cal? - where did you do your research when you first found out your were expecting lil man? books? blogs? internet? - how did you keep from getting overwhelmed with all the info out there? or did you? - did you watch what you ate carefully? what about exercise? - what's something you wish you had known going into pregnancy? - do you have a birth plan? are you going to do an epidural? You and Bryan seem to have a great relationship and obviously have been together a while without children. Have you and him thought of ways to keep your love alive when the baby arrives? Carve out anytime for just the two of you? Any marriage classes or advice from others that you can share? Now that I'm pregnant, I think of this a lot. My husband and I are like you and Bryan in a lot of ways as far as being together a while and being eachother's best friends. Things are sure to change some after baby. So I'd love to hear what you two are doing/will do, if this is something you two think about too? Ohh I might need to steal this post idea from you! I would love to know what's surprised you the most about being pregnant? I feel like there was a lot I was unprepared for and totally surprised about!